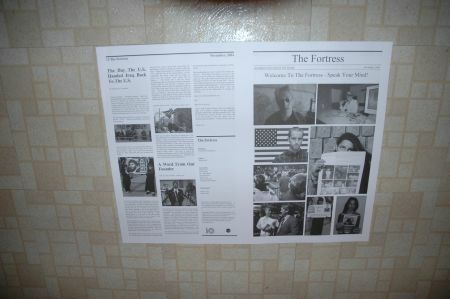 November Issue of The Fortress Hits The Street! Another issue of The Fortress! I guess I should start with me cutting a check for the printers and then driving around back to pick up the papers. I should have taken the hint from "I'll meet you at the back dock" - because what faced me as I backed up was a skid stacked with thousands of pages of print! 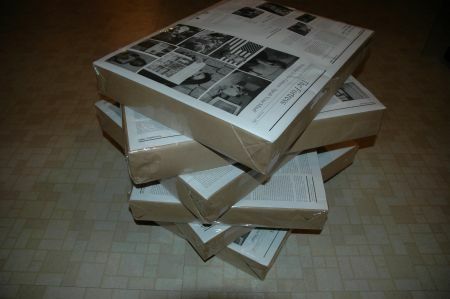 I piled the packages of full sized print (each one with 500 copies) into my car and thought about all the fun filled hours I would have putting the papers together. Step one: Sort the stacks into the individual sheets. Above you will see one such stack (taken as I was emptying out my car); we then separate each segment according to position in the newspaper. Step Two: Sets of pages are lined up to be sorted. 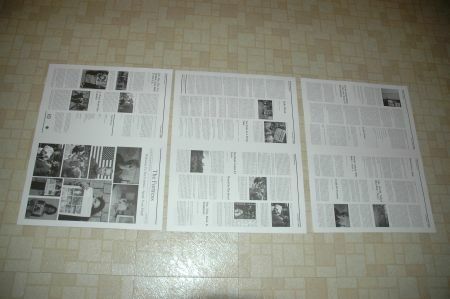 Step Three: The pages are folded and creased. There is now one more issue of The Fortress! This is fun the first time around, then it is just work..... I will spend tonight doing what I described above, and then repeat the process in anticipation of my "grand tour" of Ontario Universities where we will strategically place the newspapers for the eager young people to read (anyway that is the idea.....). The last paper route cracked my windshield and God knows what will befall me this time. I will archive the experience for you to follow and to show our new viewers how their paper got to them. Please appreciate the paper in your hands, as you see what all of us did to put it there; and don't be afraid to join our merry little band. All are welcome!